Allergies are our body’s reaction to an antigen. They are due to hypersensitivity of the immune system. Allergies can be seasonal or lifelong (perennial). There could be food allergies from foods like milk, eggs, peanuts, tree nuts, soy, wheat, fish or shellfish. There could be allergies due to pollens, animal fur, dust, medicines, foods. Allergies symptoms include coughing, itchy, watery eyes, sneezing, headaches, congestion, skin rashes and difficulty in breathing, etc. Other symptoms could be nausea, vomiting, swelling of the tongue, diarrhea, dizziness and abdominal cramps. 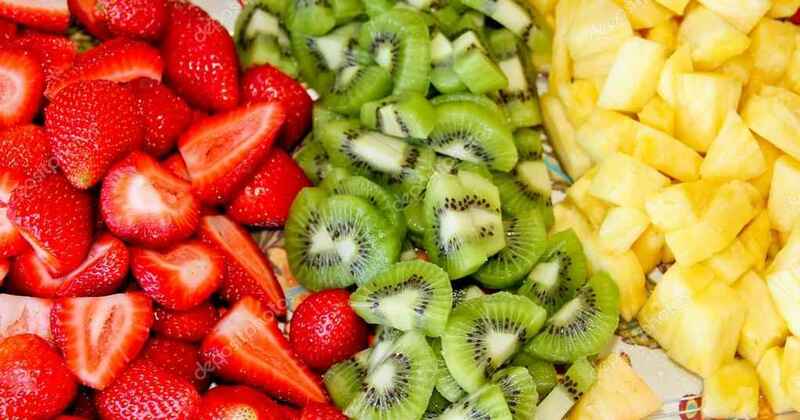 Fruits like Kiwi, Strawberry, and Pineapple show excellent benefits in relieving allergy symptoms. Pineapple has an enzyme called bromelain, which can reduce irritation of allergic problems like asthma. Fruits and vegetables are a source of vitamin C and Vitamin E which helps in easing swelling associated with allergies. It is recommended to take vegetables like eggplants, green beans, zucchini, spinach, broccoli, and tomatoes. Onions are very beneficial in fighting allergies as they contain quercetin which is a chemical that reduces histamine reactions. The same quercetin is found in apples, cabbage, cauliflower, berries, peppers, and parsley. It is said that a pregnant woman how ate apples and fish during pregnancy, reduced the risk of their children developing both asthma and allergies. An anti-inflammatory diet is recommended for patients prone to allergies. The anti-inflammatory foods include foods that contain healthy fats, such as olive oil and fish like tuna and mackerel which is rich in omega 3 fatty acids. The spice called Turmeric has a component called curcumin, which block the release of histamine and prevent allergy symptom from developing. Turmeric is the best anti-inflammatory herb which can be taken with milk, smoothies, and food. The Mediterranean diet is also good for allergy patients. This diet includes grapes, oranges, apples, fresh tomatoes, whole grains and nuts with a lesser amount of meat. The diet also recommends red wine in little dose as it is good for the heart and airways. Yogurt or probiotics help with relieving allergy symptoms like a runny nose, and congestion. Kefir is a yogurt drink that contains probiotics and helps in preventing seasonal allergies. The yogurts that contain ‘live active cultures’ should be taken. Sauerkraut and Kimchi may also be taken. Probiotics that one gets in fermented milk, or as a dietary supplement also helps in regulating the immune system. One may also try coconut milk yogurt. Honey: Local honey in small doses early in the allergy season helps in preventing allergies. Pumpkin seeds are packed with magnesium, which is a muscle relaxing mineral and helps in opening the airwaves so one can breathe better. Magnesium deficiency may boost histamine levels. One needs to include almonds, sunflower seeds, oatmeal, green leafy vegetables and dark chocolate to get sufficient magnesium in the diet. Flaxseeds contain a mineral named selenium, which can reduce allergic response. Walnuts or other tree nuts rich in omega 3 fatty acids. Garlic extract can help decrease an allergic reaction and help prevent allergy by blocking the production of chemicals that cause the reaction. Garlic should be included in cooking, but the benefits of eating raw garlic are more. Wasabi: It is a pungent green paste usually served with sushi. It has a potential to unleash histamine in the system. Wasabi helps in opening up the nose and help in breathing better. Some foods surely make the symptoms better. The person fighting allergies should take hot drinks and soups as often as he can. The fluids warm up the stomach and the airways and thus help thin mucus in the lungs, making it easier to cough up. Sipping a cup of Green Tea is very good for allergies. Tea contains natural antihistamines and surely helps in relieving symptoms like morning sneezing. We all make the enzyme diamine oxidase (DAO) to keep the histamine levels at a tolerable level, by taking vitamin C, Vitamin B6, zinc and copper, they help in DAO synthesis are thereby fought allergies. Taking a vitamin tablet might not be as effective as having fruits like oranges to boost vitamin C in the body. A diet high in Vitamin A and fiber can fight off the effects of food allergies like that of peanuts by boosting the immune system. It is advised to stick to antioxidant-rich whole food diet, which means less refined carbohydrates and less sugar. It is important to avoid eating raw fruits and vegetables as they might trigger allergy symptoms due to pollen in them. Some pollens have proteins that are similar to raw fruits and vegetables and the body might react to it. Like if someone is allergic to ragweed, they will have a reaction to eating cantaloupe or watermelon. Raw apples or pesticides on lettuce may bother the allergies. One may stick to canned or cooked foods when allergies are bothering. One needs to avoid eating spices and spicy food as the spices trigger the release of histamine, which may cause swelling and stuffiness in the nasal passages. The same can happen in people who consume alcohol. Losing weight and sticking to a low salt diet often helps the patients in faster recovery from allergies. Low salt diet can improve lung function and decrease the symptoms associated with allergies. One needs to cut down on the intake of processed and fried foods. More processed foods can have too many omega-6 which increase the level of inflammation in this body, putting one at higher risk of allergy symptoms. Eating a diet rich in natural antihistamines can help prevent the allergic reactions from happening and reduce the need for any medications.